If you want to understand some of the "big picture" issues in our society I strongly encourage you to read this book. Peter Drucker's Management Challenges for the 21st Century and Daniel Pink's Free Agent Nation are two other good reads on a knowledge-based economy. While Mr. Enriquez spends most of the book talking about genomics (his area of expertise and knowledge) and the implications arising from developments in the area, he also tries to illustrate the impact such discoveries might have on the world economy in a very basic, easy-to-understand manner. Mr. Enriquez does an excellent job in talking about the importance of education and how the large differences among certain geographic regions may lead to a larger divergence of wealth in the next century. In talking about genomics, Mr. Enriquez is quick to talk about cloning and the moral and ethical issues that will arise from such technology and how it will be EXTREMELY TOUGH to policy this technology due to its rapid evolution and ability to move into other countries borders. In the past the evolution of public policy was adjusted with the technologies but genomics is different in that we are talking about the potential to create human life via cloning, which stirs up all kinds of moral and social issues which affects politicians and their voting constituencies. The one thing I know is that genomics is revolutionizing modern medicine as we breathe today. The new drugs, cures and foods that will be created and these WILL have VERY PROFOUND impacts on our standard of living in the next century and will cause tons of social implications. This book is your entrance into learning about geonomics in a very easy to read book. I highly recommend purchase of the book. 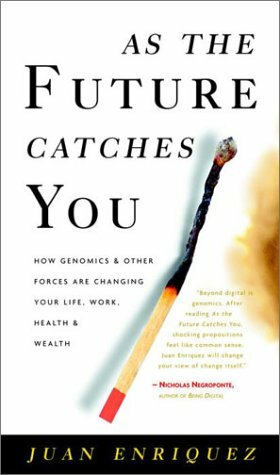 If you read only one book about the looming genetics revolution, As the Future Catches You would be a pretty good pick. After laying a foundation with a basic introduction to DNA and the genetic sciences, Juan Enriquez takes the reader on a tour of the mystifying advances that are putting humans in greater control of their own evolutionary destiny. This book is designed as much to inspire questions as to answer them, and uses a variety of font styles and sizes and almost poetic prose to provoke the thoughtful involvement of the reader. We from getAbstract recommend this book to any reader who doesn't want to let the future catch him off guard. This book reads like an engaging lecture. If you're looking for an extensive and scholarly work . . . you'll give it a single *. If you're looking for a well written, extended and readable Powerpoint presentation (and I mean that in all seriousness) you'll rate this book much more highly. I was surprised by how light the book was on words/$ but was pleasantly surprised that after I'd adjusted my expectations the book was readable and engaging. And it's significantly less expensive than the thousands Enriquez probably charges to deliver this presentation in person . . . I am a librarian. We have this book in our collection only because it was given to us for free. I'm not sure what all of the praise is for. It is puzzling to me. The most telling phrase was in the afterword: "I apologize for simplifying so many debates and concepts." At least he knew what he was doing. I found this to be a turbulent stream of factoids, hero worship, and incomplete ideas. The author seems not to distinguish between opening a discussion and failing to finish a thought. The quantitative statements are sometimes incorrect - his decimal points seem to wander as much as the rest of the presentation. Visually, the text is a mess. Maybe he wanted it to look lively and creative, instead of putting the life into the text itself. His typographic "creativity" tops out around the Crayola level, though. It's what I'd expect of someone who just discovered all those cool controls over fonts, sizes, layout, etc., but has not yet discovered they don't all need to be used on any one page. In fact, this typography interferes with a good reader's perceptual habits. I actually like aggressive use of type, like some of David Carson's - but Carson brings visual competence to the page. I have been trying to organize my thoughts for my thesis for quite sometime. One of my advisors suggested this book to help jump start things. The book outlines the literature review, abstract, etc and gives great examples as it goes. This book helped save my sanity during such a hectic time. The discussions about email and the internet are very outdated, however for those new to computers and internet research, it is a great intro. Research, it is safe to say, is probably not the average person's favorite course to take in school. The subject itself, for most, is bland and boring and probably not very accessible from a learning standpoint. Enter Leedy and Omrod. "Practical Research" is just an outstanding book to learn research from or to teach a research course with. First off, the book is small and it is written in simple language with "practical" examples. This makes the subject a lot more accessible to the average reader. Second, it contains lots of helpful hints and checklists to help make the learning process easier. The companion website for this book contains practice tests that the students can use to gauge their learning (as well as e-mail results to get feedback from the instructor). Though the book is short, it is still very thorough and to the point. There is no tradeoff in quality of information for brevity which is a great point in favor of this book. Overall, this book is a superior learning tool because it communicates the research process very clearly. 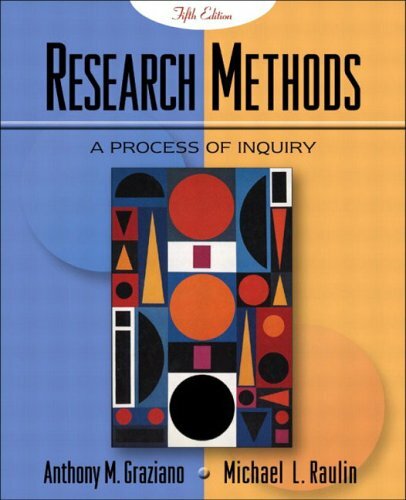 A student at any level, be it, middle school, secondary school, undergraduate or graduate, can easily learn the research process from this text. We used this as one of the texts for a graduate level research methods course I took and it was a big hit with all enrolled in the class. 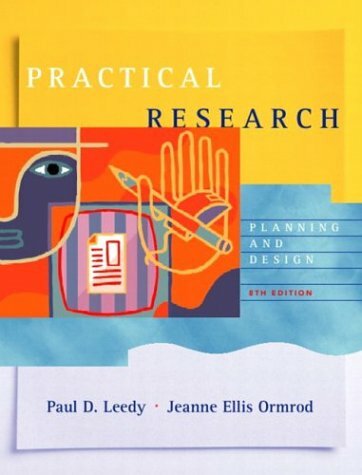 Overall, "Practical Research" is a great learning solution whether you are independently trying to learn research methods or if you are an instructor looking for a great textbook for your class. I got less than I expected when I paid almost full price for this book. Yes, it is very usable, but not excellent condition. The book arrived with little or no packing material and was not in a sealed envelope. The next time I need to buy a textbook, I will be wary about getting a used one from this seller. I wish the author realizes not everything must be put in the form of an analogy! Apart from that the book is a good review of how to go about a research paper, giving valuable advice on how to avoid pitfalls. As somebody mentioned, the Computer Prompts really are very basic. A valuable book with some useful advice. This would be a very useful book for anyone who is interested in the philosophy of research, or who is writing a research proposal, or simply trying to work out what to do for their research project. Chapter 1 includes "What research is" and "What research is not" - a good start! Other chapters look at the tools of research, how to choose a problem, reviewing related literature, statistical techniques for looking at data and so on. A particularly useful section looks at common reasons for project bids to be rejected (Ch 6). There's plenty of good advice throughout the book. I found the computer prompts less useful. They covered things like email, newsgroups and the internet which I already use extensively. However, for a student just starting out they would be useful pointers. Since the book is not specific to any level or subject of research there are bound to be parts that are not relevant to the individual reader. But I feel there is something for everyone. Bill Bryson is one of the world’s most beloved and bestselling writers.In A Short History of Nearly Everything, he takes his ultimate journey–into the most intriguing and consequential questions that science seeks to answer.It’s a dazzling quest, the intellectual odyssey of a lifetime, as this insatiably curious writer attempts to understand everything that has transpired from the Big Bang to the rise of civilization.Or, as the author puts it, “…how we went from there being nothing at all to there being something, and then how a little of that something turned into us, and also what happened in between and since.”This is, in short, a tall order. To that end, Bill Bryson apprenticed himself to a host of the world’s most profound scientific minds, living and dead.His challenge is to take subjects like geology, chemisty, paleontology, astronomy, and particle physics and see if there isn’t some way to render them comprehensible to people, like himself, made bored (or scared) stiff of science by school.His interest is not simply to discover what we know but to find out how we know it.How do we know what is in the center of the earth, thousands of miles beneath the surface?How can we know the extent and the composition of the universe, or what a black hole is?How can we know where the continents were 600 million years ago?How did anyone ever figure these things out? I like Bill Bryson's writing style. This is a book one wishes they read as a teenager. It really brings science alive. One feels like they are witnessing events as they occur in the first person. I like how Bryson takes scientific topics and makes them simple too understand. Bryson puts numbers in perspective and helps the reader understand the spatial enormity or complexity of the elements, atom, planets, and stars. Its easy to retell a Bryson story because they have good imagination well connect ideas that flow into an interesting story without sounding too intellectual. Like, "What is it like to be inside of an Cell? How do cells work? Who discovered DNA and why?" Question like these. I think reading "A Short History of Nearly Everything" is a great introduction to science, astronomy, biology, and geology. 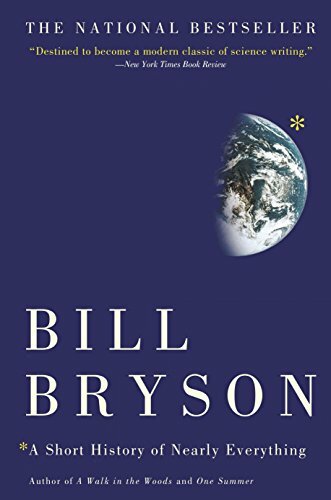 Bryson keeps the narrative down to earth, terminology to a minimum, and brings out interesting viewpoints on the birth of the cosmos, the self-repairing DNA, life on planet earth, and the composition of the earth. Bryson did a job not boring the reader with the mysteries of science. Its entertaining reading and not difficult material to understand. Bryson presents thought provoking material that makes one want to read many other published books by Bryson. Bill Bryson is one of those rare non-fiction writers who can combine anecdote, humor and actual information, all in one book. Here he covers the history of the earth, starting with the big bang and covering all sorts of ground since then, including why you should be really afraid of meteors (by the time we spot the big one it'll be too late) and why you should think twice about that next visit to Yellowstone (the big one is about due). As with most of his books it's clear he's done a lot of research, and the book is larded with the kind of stories about Famous Scientists that you've probably never heard...but also full of the sort of survey scientific information that will leave you thinking you've learned something really interesting. Who will like it: lovers of pop science, lovers of Bill Bryson, people willing to read a thick book from start to finish. Who won't like it: people bored by pop science or any science at all. This book is aimed at people who either know very little about science, or who studied it in school and then forgot it all (my case). I read some of the reviews here and was shocked at how people criticize Bryson, especially saying he got scientific terms mixed up or had errors in his book. He is not a scientist and in my opinion that makes this book that much more impressive! Bryson devoted years of his life to learn this material, and to think we can take it all in by reading a book.. well it just doesn't seem fair! I was sad when I reached the end of the book, I wanted it to continue. I learned so much from this book, and it's interesting how many times the subject material in this book comes up in every day conversations. Bryson approaches history from two angles: Astronomy and what we know about the universe, and Evolution and what we know about life on Earth. I learned so many things I didn't know. Fascinating facts such as that meteorites are used to date the earth with carbon dating (they're the same age). Meteorites contain proteins needed to build life. Human like species have been on Earth for 1 million years. After finishing this book, I find myself thinking about topics like these during my free time. That's how impressive this book is. If you love science, this won't be a book you just read and forget. It's a book that will teach you things you'll be thinking about for a long time. Honestly I cannot recommend this book highly enough. If you're interested in science, it is a must read. The book's title is very gripping but somewhat misleading - it is in fact a book of science tabloids - in a good way. It covers basic findings and histories of almost all major areas of natural sciences in a shallow but easy to follow manner. It is not intended to be introductory to science and science history (find a textbook instead), it is a fun-fact book of science and science history. - Components of your daily household cleaning powders like Comet and Ajax are made from the huge ash deposit in eastern Nebraska - they are leftover volcanic ashes from the ancient monstrous eruption of Yellowstone. - Marie Curie, the only person to win Nobel prize in both chemistry and physics, was never elected to the French academy of sciences largely because she had an affair with a married fellow physicist after Pierre Curie died in a traffic accident. Madame Curie eventually died of leukemia and her papers and lab books (even her cookbooks) are so dangerously contaminated by radiation that those who wish to see them must wear protective clothing. - Clair Patterson (a University of Chicago alumnus), who in 1953 gave the definitive measurement of the age of the Earth (4,550 million years - plus or minus 70 millions) by analyzing lead/uranium ratios in old rocks and meteorites, was also the leading expert in atmospheric lead poisoning and the early advocate of cleaning lead additives from manmade product. To his credit, Clean Air Act 1970 eventually led to the ban of leaded gasoline in United States in 1986. Almost immediately the blood lead level in Americans dropped 80%. Informative tabloids like these are all over the book. Bryson did a perfect job of bringing dull facts in history of science into fun everyday life experience. He compiled a huge amount of anecdotes from otherwise hard to find sources and weaved them together seamlessly in fluid and humorous writing. It makes the reading of science fun. The best book you would be able to read in your lifetime! I think that Richard Preston deserves all five stars for this thrilling book on real life experiences with deadly Ebola Viruses. He took an accumulation of true stories and turned it into an interesting and spellbinding book that hardly seems true. This book is easy to follow, even though the whole is scientific. Preston balanced the scientific language and factuality with an interesting plot and rounded characters as in a fictional book. Preston went into painstaking details to turn the Reston operation and other experiments into lament terms that all readers might comprehend. His magnificent writing style also came through in his account of nurse Mayinga's journey through the city and how catastrophic the event actually might have been. I really enjoyed the amount of effort Preston put forth in describing what Ebola and Marburg actually do to the body, prior to and during death. Although the book was very good, I do think that Richard Preston might have left out the entire fourth part. It had no real influence on the situation at Kitum Cave or what the reader thought of Africa. With all things considered, I strongly advise this book be read by everyone and I will certainly recommend this book to everybody I know. It starts with a simple headache. Then maybe you get a nosebleed. After a few days, you know you are extremely sick. The lining of your stomach and the top layer of your tongue literally fall off. Your organs turn into mush. Excessive bleeding from every natural opening in your body occurs. And since your blood can't clot, the bleeding won't stop. Black vomit mixed with blood gushes from your mouth. Then, you die painfully with a mask-like expression on your face. This doesn't even sound like it could exist, does it? Well it does. It is death by a virus known as Ebola. It is especially contagious in monkeys and can jump species over to humans. 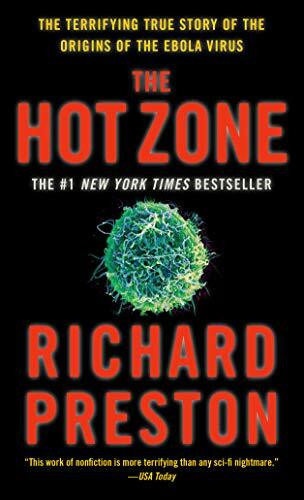 The Hot Zone, by Richard Preston, describes outbreaks of this and other "hot" viruses in locations around the world, including a city near Washington, D.C. Virus experts in the Army need to unravel the Ebola mystery and try to protect the public from this vicious disease. Preston has taken a true story and unveiled its horror. I couldn't believe how descriptive his writing is. If you want to read a true modern day thriller, then this is an awesome pick. I highly recommend it and am looking forward to reading more from Richard Preston. This book happened to be my Physics book to read and i thought it would just be some people trying to track down this deadly virus. I thought it would all be fiction and i'd wright a report and get a good grade. Turns out, this book is fiction, one of the scariest books i've read, and one of the few books that at parts i couldn't put down! Some parts didn't appeal to me as much as others (Thats why i give it a 4). I really liked the book and will encourage people to read it. This is one of the most exciting books you will ever read. And the scary thing is that the story is true. This page-turner will grip you from the onset and leave you will a chill down yor spine when you realize the nature of the world of virology. Preston makes the story flow well from beginning to end. He makes feel like you are right in the middle of the story .. almost like you have a role to play. It wont take you long to read this book, and it is written in a comfortable style. It is a very good review on how things developed between world wars. It provides a good insight of the thinking of the different countries and how they coped with their doctrines and how much they took an advantage of the WWI experiences. I am rating 4 stars because actually I would like much more information rather than 30 pages on each subject. This is an anthology of various articles. Generally anthologies are the pits as they tend to lack a central them and the quality will vary. These articles are generally by the authors and as such they are of an even standard. There are a number of chapters that discuss a range of issues from the use of Tanks to the development of the Aircraft Carrier. The book is interesting although the area covered is naturally enormous and the amount of space that can be devoted to complex subjects is naturally limited. Despite this most of the essays are interesting and not only for what they say. In the first essay about the development of armored warfare by way of an aside the writer attacks Gueridian as a sycophant and also as a person whose reputation was largely the result of self publicity. Later the English theorists Fuller and Liddell Hart are critiqued as presenting overly schematic histories of the First World War which warped the truth to fit in with their own theories. Interestingly the essay then goes on to suggest that the first world war infantry battles were so complex that even now we struggle to understand them and for that reason it was no surprise that Douglas Haig had the problems that he did. All in all an interesting book although again very much a starting point for the issue it covers. 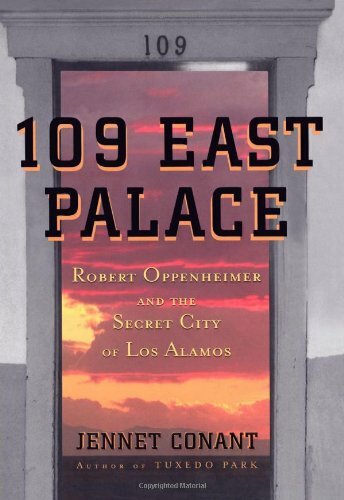 This may be the one book Secretary of Defense Don Rumsfeld should read. It is a serious systematic look at military innovation between the first and second world wars and its ten chapters run the gamut from aircraft carriers to submarines to mechanized combined armed warfare (the Blitzkrieg) to the development of radar, the emergence of amphibious landing capability, and the evolution of strategic bombing campaigns. There is a wide divergence of patterns both between topics and between countries. The British led in aircraft carrier development but made a series of organizational and technological choices that left them far behind the Japanese and the Americans. The British also led in the development of the tank but then rejected it as a mobile warfare system and were rapidly supplanted by the Germans who used the 1920s British tests as a basis for their development of Blitzkrieg. The submarine was rejected politically by everyone but was then developed effectively by the Americans and the Germans. The American torpedo failures are a maddening study in bureaucratic rejection of reality and a sober warning to the current peacetime Pentagon. 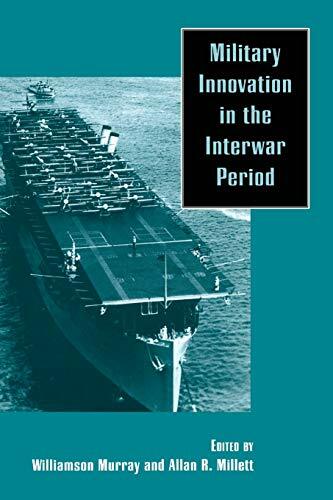 This book captures the complexity and the lessons of peacetime military innovation as well as any that has been written. It should be required reading for everyone who wants to work on the current problems of transforming the Pentagon. Williamson Murray (Editor), Alan R. Millet (Editor), combine again to publish a "must have" reference work for any serious military professional. The articles are universally excellent, well researched, and full of analysis. As military policy makers and strategists confront the ambiguities of the 21st Century, this work provides superb lessons learned from history. Buy the book and read it - it will be time and money well spent. IDEO, the world's leading design firm, is the brain trust that's behindsome of the more brilliant innovations of the past 20 years--from the Applemouse, the Polaroid i-Zone instant camera, and the Palm V to the "fat" toothbrushfor kids and a self-sealing water bottle for dirt bikers. Not surprisingly,companies all over the world have long wondered what they could learn from IDEO,to come up with better ideas for their own products, services, and operations.In this terrific book from IDEO general manager Tom Kelley (brother of founderDavid Kelley), IDEO finally delivers--but thankfully not in the step-by-step,flow-chart-filled "process speak" of most how-you-can-do-what-we-do businessbooks. Sure, there are some good bulleted lists to be found here--such as thesecrets of successful brainstorming, the qualities of "hot teams," and, towardthe end, 10 key ingredients for "How to Create Great Products and Services,"including "One Click Is Better Than Two" (the simpler, the better) and "GoofProof" (no bugs). The Art of Innovation is the story of the famous Palo Alto based design firm, IDEO. The book is easy to read and moves quickly. The author, Tom Kelley, is the brother of founder David Kelley. Tom is the General Manager and is an ex-management consultant. This is important because the book really devolves into a light treatise on business management practices. This makes sense since given Tom Kelley's responsibilities at IDEO and his background. It also explains the Tom Peter's Foreword. If you like Tom Peter's books, you will enjoy this book. If you are looking for real insights into the IDEO design process you will be disappointed. Most of the insights are of a personnel management nature, and even those are at a relatively high level. Mr. Kelley pokes more than a few veiled barbs at the slow industrial giants who simply cannot compete with the brain power and management prowess at IDEO. That may sound sarcastic, but Mr. Kelley's pride in his company often crosses that fine line into arrogance. There are a few actual projects described to point out how valuable a certain IDEO practice is. There are repeated references to IDEO's contribution to the invention of the Apple mouse and follow-up work on the Microsoft Mouse. Also, a great deal of time is spent talking about the redesign of the common shopping cart that was done in one week for a segment on Nightline. I know that IDEO has had many important clients and recent important projects. Perhaps they can't talk about them because of non-disclosure agreements. There are color pictures of some products at the beginning of each of 15 chapters but often there is no mention of those products in the text. Some black & white photographs of products and the IDEO workspaces also accompany the text. There are no diagrams or illustrations. A great deal of the book outlines the emphasis that IDEO puts on the treatment of their employees and their penchant for quick and frequent prototyping as a key to success. All projects start by assigning a "hot" team and letting them brainstorm and prototype their way into some great ideas. No details are given on how the teams are formed or managed. This book is for you if you are looking for a light management practices book and just a little insight into a premier design firm. You will probably be disappointed if you want to find out how products are designed or what specific processes are used to manage the design process. You also will not get a great deal of competitive information about IDEO. The book assumes that you have at least a general idea of what Industrial Design is about. Tom Kelley admits that workshops about the "IDEO way" have been turned into a profit center. They give seminars on how to organize product development at client companies. I could see IDEO including this book with their seminar, or perhaps they could give it to a prospective client to whet their appetite. It definitely leaves you wanting more information. I am left wondering, "How much is that seminar, and will they let me in?" There are dozens of excellent books which discuss innovation. This is one of the best but don't be misled by the title, "Lessons in creativity from IDEO, America's leading design firm." Unlike almost all other authors of worthy books on the same subject, Kelley does NOT organize his material in terms of a sequence of specific "lessons"...nor does he inundate his reader with checklists, "executive summaries", bullet points, do's and don'ts, "key points", etc. Rather, he shares what I guess you could characterize as "stories" based on real-world situations in which he and his IDEO associates solved various problems when completing industrial design assignments for their clients. "We've linked those organizational achievements to specific methodologies and tools you can use to build innovation into your own organization...[However, IDEO's] 'secret formula' is actually not very formulaic. It's a blend of of methodologies, work practices, culture, and infrastructure. Methodology alone is not enough." One of the greatest benefits of the book is derived from direct access to that "blend" when activated. It is extremely difficult to overcome what James O'Toole characterizes, in Leading Change, as "the ideology of comfort and the tyranny of custom." He and Kelley seem to be kindred spirits: Both fully understand how and why truly innovative thinking encounters so much resistance within organizations. Whereas O'Toole suggests all manner of strategies to overcome that resistance, Kelley concentrates on the combination ("blend") of ingredients which, when integrated and then applied with both rigor and passion, may (just may) produce what Jobs once referred to as "insanely great." What both O'Toole and Kelley have in mind is creating and sustaining an innovative culture, one from within which "insanely great" ideas can result in breakthrough products and (yes) services. "Loosely described", Kelley shares IDEO's five-step methodology: Understand the market, the client, the technology, and the perceived constraints on the given problem; observe real people in real-life situations; literally visualize new-to-the-world concepts AND the customers who will use them; evaluate and refine the prototypes in a series of quick iterations; and finally, implement the new concept for commercialization. With regard to the last "step", as Bennis explains in Organizing Genius, Apple executives immediately recognized the commercial opportunities for PARC's technology. Larry Tesler (who later left PARC for Apple) noted that Jobs and companions "wanted to get it out to the world." But first, obviously, create that "it." Kelley and his associates at IDEO have won numerous awards for designing all manner of innovative products such as the Apple mouse, the Palm Pilot, a one-piece fishing mechanism for children, the in-vehicle beverage holder, toothpaste tubes that don't "gunk up" in the cap area, "mud-free" water bottles for mountain bikers, a small digital camera for the handspring Visor, and the Sun Tracker Beach Chair. With all due respect to products such as these, what interested me most was the material in the book which focuses on (a) the physical environment in which those at IDEO interact and (b) the nature and extent of that interaction, principally the brainstorm sessions. 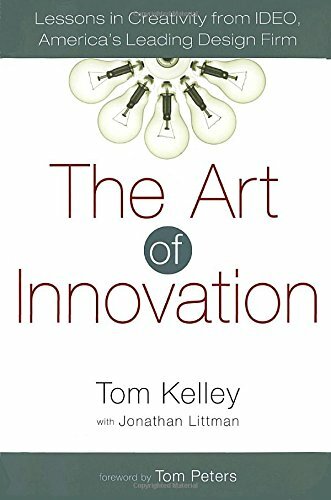 In the Foreword, Tom Peters has this in mind when explaining why Kelley's is a marvelous book: "It carefully walks us through each stage of the IDEO innovation process -- from creating hot teams (IDEO is perpetually on 'boil') to learning to see through the customer's eyes (forget focus groups!) and brainstorming (trust me, nobody but nobody does it better) to rapid prototyping (and nobody, but nobody does it better...)." Whatever your current situation, whatever the size and nature of your organization, surely you and it need to avoid or escape from "the ideology of comfort and the tyranny of custom." Granted, you may never be involved in the creation of an "insanely great" product but Kelley can at least help you to gain "the true spirit of innovation" in your life. I join him in wishing you "some serious fun." This should be the first book you read when you get out of college. Much of what Tom Kelley says would probably make your boss turn away, going against many theorems taught in management classes. But just maybe he is re-defining the perfect environments for the the ideas that change the way we interface. It is a handbook for innovation, the book share the experience of IDEO, the methods and the work practice to generate new ideas and the process of turning ideas to product. The first one is observation, people many ignore this point or pay little attention on that point. Tom mentioned a point that, we should user-oriented. Observed people how actually use a product instead of only interview them. Because some of customers are lacking product knowledge they cannot express the difficulty of using the product, even they do not fully utilize the product, so you may only get limited insight from interviewing them only. I know that many people know the term of Brainstorming, which is a method of ideas generation. However, how to have a good brainstorming is a difficult task. The third process is making prototype. It helps to solve the problem in 3-D, and let you know the problem or mistake in early stage of the process. The last insight is about the quality of the team members. They should broad in their skills and interests, deep in their knowledge and experience in one or more disciplines. All these could enhance the cross-pollination. All they should accept the divest within the team. No disease the world has ever known even remotely resembles the great influenza epidemic of 1918. Presumed to have begun when sick farm animals infected soldiers in Kansas, spreading and mutating into a lethal strain as troops carried it to Europe, it exploded across the world with unequaled ferocity and speed. It killed more people in twenty weeks than AIDS has killed in twenty years; it killed more people in a year than the plagues of the Middle Ages killed in a century. Victims bled from the ears and nose, turned blue from lack of oxygen, suffered aches that felt like bones being broken, and died. In the United States, where bodies were stacked without coffins on trucks, nearly seven times as many people died of influenza as in the First World War. In his powerful new book, award-winning historian John M. Barry unfolds a tale that is magisterial in its breadth and in the depth of its research, and spellbinding as he weaves multiple narrative strands together. In this first great collision between science and epidemic disease, even as society approached collapse, a handful of heroic researchers stepped forward, risking their lives to confront this strange disease. Titans like William Welch at the newly formed Johns Hopkins Medical School and colleagues at Rockefeller University and others from around the country revolutionized American science and public health, and their work in this crisis led to crucial discoveries that we are still using and learning from today. 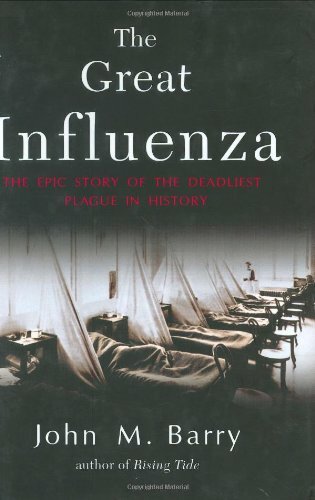 In The Great Influenza, John Barry has produced a massive and exhaustively researched description of one of the greatest disasters of human history. At least, from the American point of view. While there are a few glancing references to what was going on in the rest of the world, there is no serious discussion of any attempts to deal with the pandemic in other countries, even in other industrialized countries. On the other hand, Barry has chosen a very specific point of view: the transition of American medicine and medical training from folk wisdom to science. It's a compelling point on which to balance a long and exhaustive (there's that word again) study of how America and, specifically, American medicine confronted an epidemic in which people were dying faster than the technology of the time could handle, an epidemic in which society itself was nearly overwhelmed by death. As other reviewers have noted, the book's weakness is a tendency towards melodrama, as in the far-too-often repeated tag line "This was influenza. Only influenza." After a while, you think to yourself, "Yes, we get it. Give it a rest." On the other hand, the book has one of those quirky displays of real brilliance in the last two chapters in which Barry deals with how science is done well (in the case of Oswald Avery) or done poorly (in the case of Paul A. Lewis). These two chapters are so strong that they could stand on their own, and what they have to say about the process of scientific thought itself is fascinating. Avery's story is that of a man who was just relentessly focused, who kept digging deeper and deeper into a single issue until he discovered the source of heredity itself. Lewis's story, on the other hand, is that of a man who simply lost his way. Distracted by the need to administer an institute, the need constantly to raise money, to deal with the politics of science, the need to socialize and just plain hustle to support the work of others, Lewis lost the focus that Avery had and ending up flailing in a sea of theories and methodologies. In fact, if you don't read any other part of this book, read these two chapters. There is no question about The Great Influenza being a monumental work. It's so good that you just have to overlook the bits of melodrama that pop up from time to time. The research is, well I obviously can't use "exhaustive" again, so let's say nearly encyclodedic. In fact, there's so much research, and so much documentation that Barry has used an odd method of footnoting. Instead of using footnote numbers that refer to the notes section at the end of the book, you have to turn to the notes section and find the specific page and text being referenced. Unfortunately, as a result you don't know while you're reading which bits have footnotes and which don't. I'd prefer actual footnote numbers. Ah, well. I'm sure it seemed like a good idea at the time. In any case, Barry has produced a massive and important work of epidemiological history which is, at the same time, as readable as a thriller. In writing this review, I kept wavering between giving it four stars or five stars and finally decided on five based on the scope, the thoroughness, and what Aristotle would call the "point of attack," that is, the point at which the story really begins, which is, in this case, the birth of truly scientific medical education in America. All in all, it's a truly fascinating and immensely readable piece of history. Barry details the Spanish influenza pandemic of 1918 in great detail. He starts by setting the stage of how American medicine was practiced at the end of the 19th century, and how there was little control or respect for the profession. And rightly so... Nearly anyone could call themselves a doctor and do nearly anything. But through the efforts of a few key people, John Hopkins university was formed to bring the medical education up to European standards. Most of this transformation was occuring when the flu pandemic started. This is where the book gets interesting... and frightening. Because of World War 1, recruits were overcrowded into training facilities that were less than sanitary. When the flu first broke out in one of the army camps in the states, it was quickly transferred to other camps when soldiers transferred. From there, it easily jumped into major cities, decimating large numbers of people. And when these soldiers went overseas, the flu went with them. Being especially contagious, it swept the globe in short order and left, by some estimates, over 100 million dead. That is so hard to comprehend. When you look at the struggle they had to even identify the cause of the illness, you understand how it could so easily run rampant. One would think that it couldn't happen today, but one would be wrong. SARS, AIDS... diseases that defy attempts to quickly identify the virus, and are resistant to attempts and efforts to treat them. It's not hard to imagine how a pandemic could start so much more quickly today due to the ease of worldwide travel. Wow. The Great Influenza sort of blew me away. Like most people I've heard of the 1918 influenza, but also like most I've never actually read anything on the epidemic. My first introduction to the topic came as a young nurse working on a neurology ward where Parkinson's Disease was diagnosed and treated. At the time it was believed to have arisen as a late neurological response to that infection. For all I know they may still think so. During the swine flu epidemic and the controversy over whether the vaccine had caused a rise in the incidence of Guillian Barre, the so-called French polio, the 1918 flu was frequently mentioned. After reading Mr. Barry's book I can certainly see why. What amazes me most about the pandemic of 1918 is not its virulence so much as its repercussions. It definitely occurred during the most inopportune time, almost proving Murphey's law that if anything can go wrong it will and at the worst possible time. Probably one of the most significant outcomes of the flu seems to have been the effect it had on the peace terms. One is left to wonder if Wilson had not been affected by the flu in so damaging a way and at so crucial a time, whether World War II could have been avoided. Moreover much is made of the nihilism of the 1920s, that lost generation between the two world wars. The young of the era seemed to have gone through a loss of innocence that is often attributed to the effects of the WWI experience and the death of the overconfident 19th century way of life. It seems to me that far more damage to the confidence of young adults was due to the effects of the influenza epidemic. Certainly Barry's discussion makes the character of the 1920s and 1930s much clearer to me. The differential effect of the flu on the various age groups, suggests much about the effect of the virus on the immune system. Having had to manage patients with ARDS in ICU, most of them very young people like those in 1918, I can hardly imagine what it might have been like to be a nurse during a time prior to mechanical ventilation and sophisticated drug therapy. We lose ARDS patients with an unpleasant frequency even now. In 1918 I don't know how one could have helped even a single patient survive it. It had to have been appallingly painful to the staff, overworked as they were, even ill themselves as some were, to watch a patient die that way especially as the author points out again and again because so many of these patients were in the prime of life and had so much to live for yet. I certainly know what its effect has been on me over the years. Although the author attempts to reassure the reader that although we may have another similar pandemic, the outcome will be less devastating because of our modern medical facilities and experience, I can't help but think of the Titanic! It couldn't sink, you know, because it was the product of the most modern and up to date technology of its time. Maybe MRSA (methacillin resistant staph aureus) and VRE (vanco resistant enterococci) will be our armageddon! A serious and fascinating book. One every health care worker should read. I read many reviews of this book, and finally had to buy it. This is a book you can easily put down! Dense with detail and many fascinating characters, but ruined by the melodramatic style. Along the lines of: " Then suddenly, it struck with incredible force!" Not an actual quotation, but you get the idea. Over and over again he uses this same device. It ultimately becomes tiresome. I'm about halfway through, and I have not picked it up in about 3 weeks. Hold out for the (used) paperback! Gives students the most thorough understanding of cell and tissue biology, structure, and function is now revised and updated in a FULL-COLOR Tenth Edition! Reflecting the latest research in the field, the tenth edition provides students with a solid knowledge of how cell and tissue structures are linked with their functions. This book examines the structure and function of cells, the four basic body tissues, and each organ and organ system of the human body. Throughout, cell biology is emphasized as the most fundamental approach to understanding structure and function. This book presents all basic tissues followed by descriptions of all human body systems. Microscopic anatomy and physiology are well balanced throughtout the textbook.The brazilian authors, Junqueira & Carneiro, used a simple, readable language along with very good illustrations and photos (including a colored atlas) to produce this book: the result is a text in which the student will find not only precise informations but a textbook of Histology simple enough to read, to study, to learn, and to review. Perhaps, more clinical comments and/or Pathology relating topics should be included in the next edition. This book is one of the best books i've ever read in basic histology. it's really good for medical students, Simple and straight to the point. Every histologic feature had it's clinical correlation which is so helpful for students throughout their Predoc studies. 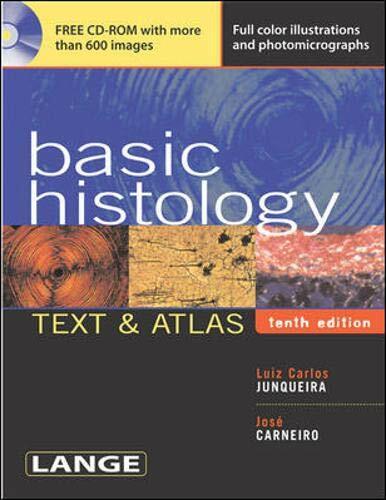 I am from Brazil and that's the book that we used at our school for histology. We kind of liked it a lot since it was very easy to read and straightforward with its explanations so you would understand it easily, plus it covered everything that you needed to know for a histology class, for 1st year medical students. 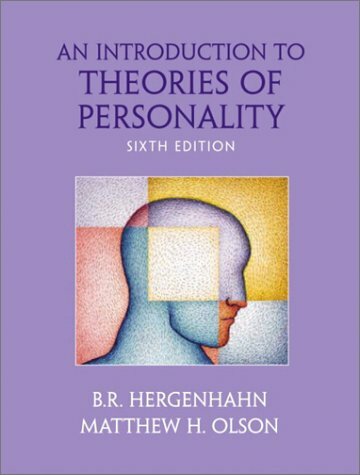 If you are a student in a very quantitatively-oriented psychology department, this may be a useful book for you. However, at a time when many research methods books are devoting much more space to qualitative methods, Graziano and Raulin's book seems a bit anachronistic. Several highly regarded research methods textbooks that are more even-handed in their coverage are David Krathwohl, Methods of Educational and Social Science Research: An Integrated Approach (second edition, 1998), and Colin Robson, Real World Research: A Resource for Social Scientists and Practitioner-Researchers (1993; second edition forthcoming). There is also an enormous literature on qualitative methods specifically; simply search this site under "qualitative research". I decided to adopt this text for my course as it is comprehensive, up-to-date, and includes a wealth of supplementary materials that are web-based, as well as available on the accompanying CD. Recommended highly for undergrad AND graduate students. Despite the abstract nature of it's subject matter, this book is a surprisingly breezy and informative read about the history of zero and it's value in the mathematics (and scientific) revolutions of the 1600s and still today. It's part history, part math primer, and part practical guide, with the later chapters focussing on how the zero is used in physics and astronomy. Seiff has an engaging style and he doesn't talk down or talk above the reader. Although Seiff obviously is an expert in difficult math, he doesn't overwhelm you with equations or get too abstract. Even sections on trig and calculus are written in everyday language that you can easily follow. The book does begin to trail off at Chapter 7-8, from here much of the book seems like filler. I preferred "The Nothing That Is" (also about the zero number) a little because I was more interested in the history and that book covers it more, but Seiff still does a fine job here with history of zero, and his book is probably more useful for students trying to know how to use the zero and it's concepts for their math classes, especially figuring out the limit and other calculations. The title of this book is "Zero: the Biography of a Dangerous Idea." 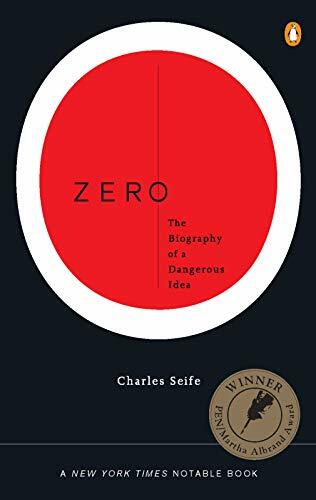 Certainly, what Charles Seife wrote does not disappoint: it IS a biography of zero. It starts from its conception in early history, and progresses to outline its development in history through the branches of mathematics, physics, art, and even philosophy. A previous reader was disappointed that the book took time to focus on physics and philosophy, but keep in mind that zero is not limited only to the mathematical realm. Indeed, it is pervasive in society, and it has affected the way we view the world. So to talk about zero yet disregard its important contributions to fields other than mathematics would be a travesty. Seife's book is a very engaging and enlightening read. Seife looks at how zero has become: the foundation for calculus (taking limits to zero), a revolutionary idea in art (3d drawings have a point of infinity to give depth perception...and infinity and zero are just different sides of the same coin), an important concept of the numberline, and many other places. Indeed, I have read this book many times, sometimes for a quick browse and sometimes for an indepth read, and it has always been a pleasure to read. Moreover, Seife is very knowledgeable in what he writes, and he brings a sense of humor as well--if you have ever read his article about the debate on cold fusion in 'Science' or 'Scientific American' (it was one or the other, its been a while since that article was published in the early 90s I believe) you'll see his sense of humor in his concluding paragraph (cold fusion or confusion anyone?). And in response to another review earlier, the reader said that in the appendix there was a proof where a=1 and b=1, and from the equation a^2 - b^2 = a^2 - ab it can be found that 1=0 by factoring the difference of squares and dividing by (a-b). The reader commented that this is dividing by 0, that such an operation violates a fundamental law of algebra (cannot divide by zero), and that an editor should have caught it. The point is that Seife is showing WHY you cannot divide by 0, that the result is 1=0 and that logic and mathematics would be invalid. He is showing why zero may be a 'dangerous idea'! In conclusion, this book is superb in its writing and content. It lives up to what it was meant to do, to show the development of zero through history. It is clear, concise, and witty. You will not be disappointed. Entertaining book for students of philosophy, historians, and math neophytes, but Seife's simple-minded application of the principle of the conservation of energy to the quantum electrodynamic sea of spacetimemassenergy, i.e. the "zero point field," among other things, reveals him to be among the least imaginitive of physicists. His dismissive proposition that "nothing can come from nothing," overlooks the very simple fact that the QED sea of energy is hardly "nothing," otherwise there would be no such thing as Brownian motion or the Casimir Effect, not to mention the space, time, mass, and energy of our universe. Hal Puthoff claims that a cupful of this so called "vacuum energy" could boil away the oceans of our planet. (The most intriguing concept of "zero" is that promulageted by today's heretics such as Tom Bearden.) Presumably, however, Seife's math and philosophical history of zero is accurate. Before reading this book, this reader had known very little of it, and it was this part that he found quite enjoyable. This is a mildly interesting and entertaining book about history of zero that unfortunately tries to be too cute with its style and to pull in so many unrelated ideas, it loses focus as you turn the pages. When "Zero" stays on topic it's OK. Seife has a pretty good grounding in most of the history, and it was facsinating to read about how the number was used for such simple purpose for Babylonians but became so important for abstract number systems later. Middle section of the book deals with zero in calculus, useful for any student toughing it out thru intro calc. But Seife gets too drawn in to all the goofy philosophical wanderings you can make about zero, he goes off on way too many tangents that don't make sense. Yes, you can't divide 1 by 0 and the number has a special role in most operations, but how do these properties threaten to bring down the whole framework of math (to paraphrase)? There's all kinds of talk about how zero and infinity are just two sides of the same coin-- why? The author tries to sound like a sage but doesn't make much sense with the claims on these pages. Whole thing comes apart in the last couple of chapters on physics, cosmology, and applied math which are slim on facts and chock-full of flowery language about how important zero is but where the author really doesn't back his claims. In fact, as the book goes on it seems to make less sense, as though it doesn't quite know what it's supposed to be saying as it moves farther afield from history and calculus. Why are these later chapters even here? They don't add anything and detract from the book's overall value. A very interesting book. The Author shows how mindsets, philosophies and cultures had to change to enable the Zero to be accepted. The West overlooked then resisted the idea of zero. When the zero idea took hold and was finally accepted it affected everything from Aristoteloism, to commerce, to Art. Even the biblical creation stories took on a different light. as the sense of perspective was developed. This vanishing point within a painting is the equivalnt of the introduction of Zero into the art world . There are some useful nuggets, perhaps, but on the whole I was happier with material I found on the web. "Wonderful, thick, rich writing on Appreciative Inquiry is currently available..." says Sue Hammond in her introduction to this nifty little book. It certainly is, but the Thin Book of AI is just enough to whet your appetite for the main course. If you've never heard of Appreciative Inquiry (or as I call it 'Looking for the Good Stuff') this is the place to start. Sue takes the essence of the Appreciative Inquiry process and makes it easy to digest. Her purpose was to create a book to help others find out enough to decide if they want to take on more about this facinating process for change. She has done it well. If you have heard of AI and are using it in your business or consulting practice, you probably already know about this book. I find it an excellent inclusion in a proposal or a follow-up gift to a prospective client. It is straight forward and succinct, yet has enough flavor to make you want more. A perfect appetizer. Buy several, as you will want to keep one in your briefcase, but you will inevitably give it away. Get Started With Appreciative Inquiry! The Thin Book of Appreciative Inquiry does all it promises to do...and more. In a very short time (a round-trip commute for most of us in Tokyo), Ms. Hammond introduces all the core elements of this exciting and effective approach to positive change in any organization. Her mini-tome led me to delve deeper into the "mysteries of organizations" and other AI authors. The Thin Book was the first step toward placing AI at the forefront of our teambuilding efforts, both within AMT Group and for our clients. HIGHLY recommended. Since Aristotle, Descartes, Newton, and Freud, we have analyzed and reduced everything to the micro level so that we can repair, replace it, or control it. This is not that kind of book. It is a new way to get perspective on issues by redirecting attention to consider the good things that are going on around us. The sheer mention of the question: What is working well around here changed my tone for the whole day. I began to listen and look for the positive and beauty and affirm it when I saw it. This is not just a positive thinking Peale book, or positive mental tape book The Thin Book of Appreciative Inquiry is an introduction to the idea that change can be managed by focusing on what works. This little book is worth it the price as it gives you a good definition of AI and is like an appetizer for the meal. Hammond has done a nice of capturing the essence of this transforming approach and provides many sample questions that let's you intuitively grasp this is good soup for the soul. I wish they would have added more to the book but that is why the called it thin- it does create a desire to know more about AI. A Real Privilege to Read! Get it! This book is larger than life. It is one of those rare books on which, I suspect, fundamental issues turn, like Newton's Principia or Darwin's Origin of Species. Gonzalez and Richards combine a breadth of scientific detail with philosophical sophistication and nuance. But the book still manages to be a pleasure to read! I first heard about this book during a presentation I attended in which one of the co-authors discussed its main thesis and arguments. Everything I heard souned fresh and was well-supported, and thus I have been eagerly awaiting its publication. Needless to say, this book has even exceeded my expectations! 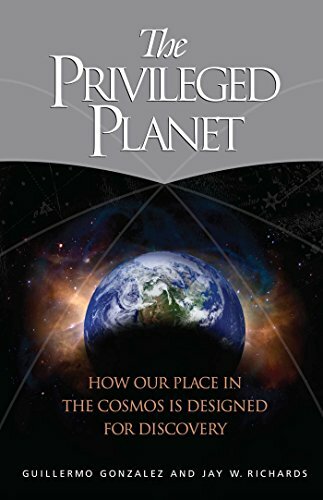 The Privileged Planet is a seminal contribution to the growing debate over purpose and intelligent design in the universe. Most of the action in the last few years has taken place in biology, with the inevitably rancorous debates over neo-Darwinian evolution. It's very refreshing to read a book on design that doesn't having anything to do with that debate. The list of endorsers for this book is truly impressive, so one need not take my word for it. The Privileged Planet will give many of our elite scientists a lot to discuss over the coming years. This is not to say that non-scientists won't be talking about it, either, since it is well-written and can be understood by a general audience. 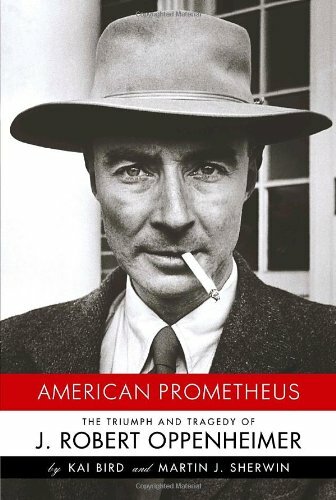 This books works on the eternal question: Are we alone in the Universe. It's clear that a tremendous number of things had to happen just exactly right for life to develop as it has. Just the right temperature, the amazing characteristics of water at this temperature range, exactly the correct amount of oxygen, carbon dioxide, and other elements and compounds necessary for life. There was a school of thought centered around the late Carl Sagen that there must be a lot of life in the Universe. He estimated that there were as many as a million civilizations in the Milky Way alone. Since then a revisionist school has come about. The authors of this book have collected a massive amount of knowledge about the nature of life on our planet, much of it just developed in recent years. Their conclusion is that the circumstances surrounding life on earth make it more rare than previous studies might have believed. Does it prove that we are alone in the universe, absolutely not, it is theoretically impossible to prove a negative. You can only prove a positive, and this question will remain until we receive a signal from outer space or perhaps when a UFO joins the flight pattern at the airport in Washington, London or where ever. After reading a number of writings by scientists who lean towards an intelligent designer and also a number by those who support blind chance as a maker, I find that there seems to be a certain ring of "sincere honesty" to be found among the former, whereas the sheer speculation and real lack of suporting evidence for evolution leaves the latter in a position that almost makes forces them to seem dishonest in there theories. The Privileged Planet reflects this honesty to which I refer. It turns out mediocrity isn't so wonderful. The book is a logical and quantitatively supported advancement of the implications of the so-called anthropic cosmological principle. Not only must a precise array of specific values be implemented if a universe that is stable on a large scale and materially complex is to exist, these same "fine tuned" values are necessary for life, for technological (intelligent) life, and for a viable "platform" for scientific discovery. Such a platform is our home, the planet Earth and its calculably favored location in space-time. "Our argument is subtle," say Gonzales and Richards, "Earth's conditions allow for a stunning diversity of measurements, from cosmology and galactic astronomy to stellar astrophysics and geophysics; they allow for this rich diversity of measurement much more so than if Earth were ideally suited for, say, just one of these sorts of measurement." If, as Fred Hoyle famously said, a super-intellect has "monkeyed" with the physics (and chemistry and biology) of our material world, then it likewise appears that this super-intellect has also presented us with unique opportunities for discovering this same precise array of specific values. The particular values that support intelligent life also provide the opportunity for knowledge of these particular values. Thus another in the growing number of "cosmic coincidences". The theological implications are, in a general sense, obvious to anyone who isn't pre-committed to excluding them. (Gonzalez is an astrophysicist, Richards a theologian and philosopher). The first section broadly quantifies the remarkable "habitability" of our host planet, treating such issues as the role of Earth's plate tectonics in maintaining the carbon cycle; the highly specific advantages of a rotating iron core (meteorological, magnetic, etc); the type and age of our star, the unique advantages of having a "twin" body with the parameters of Earth's moon; the protective function of the neighboring gas giants like Jupiter, and so forth. Also treated are Earth's surprising array of "data recorders" and their importance to scientific discovery. If intelligent beings are to ask questions about the nature of nature, Earth is a strangely ideal place for these questions to be asked. The second section considers the larger cosmos, quantifying the privileges of being between the spiral arms of a large (Andromeda and ours are the largest of the Local Group) and old galaxy, and well removed from the perils of a galactic center. Here also we consider the stunningly precise values required for stellar nucleosynthesis, the necessary advantages afforded to our location in time, the necessity of the fundamental force values being very narrowly "tuned", and so forth. Building on the quantification considered to this point, the third section examines "anthropic" and design implications, thoroughly debunks the Mediocrity Principle popularized by Drake and Sagan, and presents some general and specific predictions arising from a 'design' interpretation of the measurements and discoveries of the past century (and especially of the past three decades). The authors go on to anticipate and answer contradicting arguments, and in making their predictions they clearly challenge those who won't like their hypothesis. To be sure, some won't like it (the 'purposelessness' and 'mediocrity' faithful). But the inevitable detraction (and outright whining) will arise from personal psychological commitments and not from science. A fascinating book, highly recommended. I looked at the posted reviews before writing my own. The vast majority (more than half) rate the book at five stars. Does this prove that this is the greatest book ever written? Of course not. It is simply a result of the adage that "you will like this book, if this is the kind of book that you like." The next largest category is a rating of one star. And what does that prove? It proves that "you will not like this book, if this is the kind of book that you do not like." Apparently this book is not as simple, or as obvious as either group would tell you. In fact, I found this book to be quite complex, if one read it (or should one say, "studied") the book carefully. I would say that one has here three, or possibly four or more, "books" combined in one. First we have a book of "scientific information or facts." I found no criticism of these facts in the one star ratings. The facts are clear, complete, well reasearched and well referenced for those who wish to look further. Clearly this "book" deserves a five+ star rating. Another book is based on the "choice of facts to present." Some people may be unhappy that facts they would include, are excluded. Is this a problem? Only if you disadgee with the clear intent/agenda of the authors. There is nothing hidden here. The authors make it clear where they stand respecting the origin, and purpose, of life. One can disagree that life has a creator or designer. But that is a different premise that the one chosen by the authors. Given their premise. I would argue that the authors chose just the right science to present and to exclude. A third book involves "conclusions" derived from the presented facts. The idea that our planet is privileged to both our kind of life and also to scientific discovery, and the corolary that the requirements for both are intertwined, is intriguing. Nevertheless, I must say that I am not completely convinced respecting privilege in scientific discovery but the supporting material is 100% convincing respecting our kind of life. A fourth book, if one will, involves various conclusions respecting what one might call orthodox intelligent design. Here is where prior biases and ideas will make a big difference, ranging from a perfect five to an insignificant one. I happen to believe in a "designer" but am not a full supporter of orthodox ID, especially with respect to evolution theory. So what? Does one have to agree with the ultimate conclusions of a book to find it interesting, intriguing and even fascinating? Indeed, the readers who gave the book a one star rating, primarily because they do not believe in a "designer," still found a wealth of ideas and facts to consider - if only to reject. A Brief History of Time, published in 1988, was a landmark volume in science writing and in world-wide acclaim and popularity, with more than 9 million copies in print globally. The original edition was on the cutting edge of what was then known about the origins and nature of the universe. But the ensuing years have seen extraordinary advances in the technology of observing both the micro- and the macrocosmic world--observations that have confirmed many of Hawking's theoretical predictions in the first edition of his book. Stephen Hawking is the first physicist who was able to combine the laws of the small - quantum mechanics - with the laws of the large - general relativity - to find out something fascinating: black holes evaporate. He was also the first man who published a book on theoretical physics that has become popular world-wide (about 9 million copies have been sold). Many readers have learned a lot of exciting things about our universe from this book. So did I - even though I was a student of theoretical physics. Although this book is not as perfect as Brian Greene's "The Elegant Universe", the successor of the Hawking's book in the position of the book on theoretical physics causing such a stir, "A Brief History of Time" will remain a tour de force, a pioneering work which began a new interest in physics among masses of people. That is why do I recommend you to read this book about the big bang, black holes, the quest for the ultimate theory and many other issues. In the modern era, natural science is more than a lot of abstract thoughts and boring jargon--it is a leader of society. Newton's theory of physics, Darwin's theory of evolution, Heisenberg's uncertainty principle--all have changed the way we think about the world, influenced other disciplines, and ultimately changed society. Because of this profound effect science has on society, it is important for the general public to understand the ideas and development of science. Unfortunately, it becomes increasingly difficult to do so as science becomes more specialized and technical. Enter Stephen Hawking and 'A Brief History of Time.' The book is one of many great books that increase scientific literacy for ordinary people like me. Only someone who fully understands the basic concepts of theoretical physics could put it into clear and easy prose as Hawking does. He outlines the progress of theoretical physics and the theories that attempt to describe the universe, all in plain English. Hawking paints a picture of the universe--its beginning, its end, the direction of time, black holes-- with the wonder and curiosity of the child plus the style and confidence of a brilliant mind. One of the most brilliant minds in this century, as a matter of fact. The final sentence about knowing the mind of God--"the ultimate triumph of human reason"--reminded me of that timeless scene in the Bible where the serpent convinces Adam and Eve to eat the apple. Figuratively (*figuratively*) , that triumph is what we left Eden for. We have left Paradise for unknown horizons, for questions instead of answers, for a world of wonders. That quest is what A Brief History of Time is about. Do yourself a favor and read this book. This book is truly a gem.. small volume but packed with a density of information.. Explore fascinating topics you could not think about in your wildest DREAMS.. topics are Black holes, Entropy, Origins of universe, Time Travel. Hawkings is truly a genius among geniuses. (...) If you can finish the book, the knowledge is well worth it. 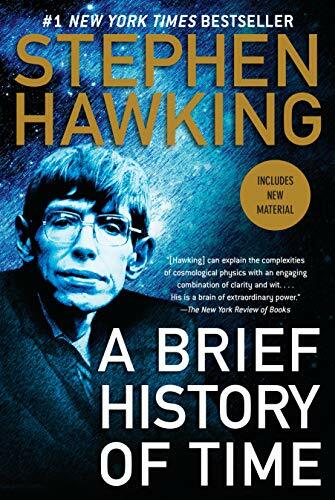 For anybody who does not have sufficient knowledge to read some of Hawking's more complex writings, this is the perfect book to get started on. It introduces you to the concepts of astrophysics, in which are explained very well. Stephen Hawking uses humor and everyday scenarios to explain some difficult concepts of astrophysics. It is a great way to simply expand your knowledge by understanding the big bang, quantum mechanics, and even sub-atomic particles. Stephen Hawking is an excellent writer, not to mention the Albert Einstein of our time; he makes this book almost seem like a novel more than a non-fiction book. I highly recommend this book to pretty much anyone, because it introduces you to astrophysics, as well as just answering questions regarding time travel, or where we came from. Hawking is succinct, even-handed, and even funny. First, it is a chronology of the various important scientists and discoveries over the centuries, all leading to where we are now. Second, it explains, between the beginner and intermediate levels, an understanding of concepts such as black holes, worm holes, the beginning and potential end of time, particles and waves, quantum mechanics, and other issues in science. Third, it is almost an autobiography of Dr. Hawking's scientific life. He interjects wonderful bits of humor and explains the concepts carefully and as simply as he can. He is also respectful of religion, briefly interjecting his ideas about how religion does not have to be incompatible with the rapidly expanding ideas of science, and that religion should embrace science more. One part I found humorous was his explanation of a bet he lost with a colleague (he seems to have a lot of long-standing bets going). He owned up to being wrong, and paid the penalty, which was a "one-year subscription to Penthouse, to the outrage of [his colleague's] liberated wife." "On dissertation proposals on which I have served, Patton is by far the most cited qualitative research text." The book that has been a resource and training tool for countless applied researchers, evaluators, and graduate students has been completely revised with hundreds of new examples and stories illuminating all aspects of qualitative inquiry. Patton has created the most comprehensive, systematic, and up-to-date review of qualitative methods available. "I am dazzled by the extent of the material that this book describes and clarifies. Patton has shifted the focus of the text to qualitative inquiry in general, which includes qualitative evaluation. New examples from his own work and that of others serve to clarify and deepen understanding of qualitative research topics and processes. New discussion of many current issues and debates in qualitative scholarship (autoethnography, ethical issues of informed consent and confidentiality, focus group/group interviews, computer-assisted analysis, the complexity of creating criteria for judging the quality of qualitative research, etc.) will bring readers up-to-date with the variety in perspectives about (and the variety within) qualitative inquiry. Most of the chapters in the book have been substantially reorganized in ways that augment the readers understanding. When anyone asks me about conducting qualitative inquiry, I will say: Get Pattons book." The Third Edition has retained and expanded upon the exhibits, which highlight and summarize major issues, guidelines, the summative sections, tables, and figures as well as the sage advice of the Sufi-Zen master, Halcolm. This revision will help readers integrate and make sense of the great volume of qualitative works published in the past decade. "Clearly, this is a vastly improved, much more comprehensive, cogently systematic, and timely review-a tour de force, one might say-of the field of qualitative research, in terms of the theoretical, conceptual, methodological, and normative dimensions/foundations of qualitative research. This is one of the strengths of the volume. It seeks to bring together theory and practice/methods without overburdening one or the other--this is as rare as it is commendable, not to mention extremely useful, not only for the professional researcher, but for the "non-professional" as well." End of Chapter Appendices: Provide excerpts of detailed examples of particular techniques, such as open-ended interviews, case studies, etc. As a senior in college who is conducting interviews with high school and college students, I would recommend this book. It provides an excellent jumping off point for both novice student interviewers as well as seasoned teachers. Patton, himself an experienced interviewer, and also an award-winning teacher and storyteller, outlines all the necessary steps involved in the interview process in a very entertaining way. The book reads much like a textbook, complete with original cartoons, historical examples, and vast personal experience. Moreover, inspirational and often amusing quotes kickoff each section. Appearing throughout the book is the fictional sage-like character Halcolm, a philosophical alter ego of Patton, who, "like his name (pronounced slowly)," forces the reader to ask "how come?" (p. A2). 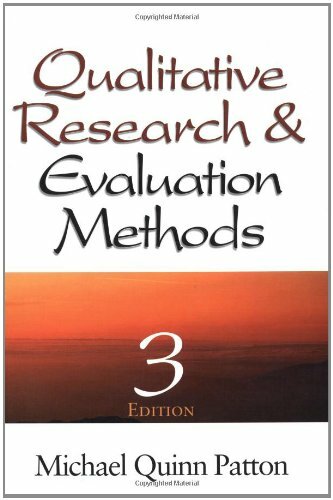 Patton has divided Qualitative Research and Evaluation into three main parts: Conceptual Issues in Qualitative Inquiry, Qualitative Designs and Data Collection, and finally Analysis, Interpretation, and Reporting. Under each section are many subsections, all clearly laid out in a very detailed table of contents. For example, Conceptual Issues is divided into four subcategories: The Nature of Qualitative Inquiry, Strategic Themes in Qualitative Inquiry, Variety in Qualitative Inquiry: Theoretical Orientations, and finally Particularly Appropriate Qualitative Applications. Furthermore, these four subcategories are then broken down in additional detail in the table of contents. The titles of these sections (and chapters) are somewhat typical for the text as a whole in that they rely on sociological terminology that may be unfamiliar to beginners. At first glance, the table of contents appears to be little more than a patchwork of intellectual vocabulary, but the book reads in much simpler terms. The index to the book is also very useful for finding numerous narrowed down focuses. I found this the most helpful. For example, when I wanted to find out about transcribing interviews, I was able to find all of the relevant chapters and information at once. Unfortunately, however, Patton's broad scope is also his main weakness. It is very easy to become bogged down by the mass amount of details and by his many examples. Also, for scholars primarily interested in the interview process, only the final section is useful, especially in the field of analysis. Patton attempts to cover all of the basics of interviewing, and provides an excellent outline, but nothing can compare to actual experience. Nevertheless, it is highly recommended that first-time interviewers consult Patton's book for an introductory guide, and even veteran interviewers can learn something from Patton's vast experience. Researchers will also find Patton's 36 pages of single-spaced references very helpful, and graduate students will find it invaluable for dissertations. No, I'm not a disgruntled grad student who had to take a qualitative eval course with this book as the bible. I'm a very happy grad student who enthusiastically pursues qualitative methods (and in fact teaches them to his undergrad students), but who learned at great expense to avoid this book at all costs. A large number of professors teaching research have latched onto Patton as the qualitative guru for valid reasons. He has done seminal work in the field, championed the process for decades, and is deservedly well respected for these efforts. The problem is using his book as a classroom textbook. This book is OK as a reference source, but the man is not a textbook author. The book is extremely difficult to comprehend, has not been revised significantly since the first edition in 1980, wanders off on tangents seldom related to the content (try the start of Chapter 5 if you need an example), fails to provide groundedness with adequate theoretical applications, and so on. ....I do use this book and quote from it when appropriate, but cannot recommend it as a textbook. If you've been asked to gather qualitative research but you've never gathered qualitative research before, then this is the book for you. Unlike other qualitative research books that often focus more on a particular phase of research, this book covers all phases in depth, from conceptual issues and qualitative reseach design to analysis, interpretation, and reporting. If you were to read this book from cover to cover you would enjoy it, but you may yawn once or twice. To ease the boredom factor, the author was kind enough to include jokes and cartoons and sage anecdotes from research guru Halcolm. If you just want to use this book to answer particular research questions, then this is also the right book for you. I've looked at several other qualitative research books and this one seems to address all the major questions a researcher could possibly have. I highly recommend this book for any and all qualitative research neophytes. This book is outstanding in its presentation of the ins and outs of interviewing. It provides many caveats and tips about how to formulate questions that do not lead but do stimulate rich answers. Since 1995, more than 150,000 students and researchers have turned to The Craft of Research for clear and helpful guidance on how to conduct research and report it effectively . Now, master teachers Wayne C. Booth, Gregory G. Colomb, and Joseph M. Williams present a completely revised and updated version of their classic handbook. Like its predecessor, this new edition reflects the way researchers actually work: in a complex circuit of thinking, writing, revising, and rethinking. It shows how each part of this process influences the others and how a successful research report is an orchestrated conversation between a researcher and a reader. Along with many other topics, The Craft of Research explains how to build an argument that motivates readers to accept a claim; how to anticipate the reservations of thoughtful yet critical readers and to respond to them appropriately; and how to create introductions and conclusions that answer that most demanding question, "So what?" Celebrated by reviewers for its logic and clarity, this popular book retains its five-part structure. Part 1 provides an orientation to the research process and begins the discussion of what motivates researchers and their readers. Part 2 focuses on finding a topic, planning the project, and locating appropriate sources. This section is brought up to date with new information on the role of the Internet in research, including how to find and evaluate sources, avoid their misuse, and test their reliability. Part 3 explains the art of making an argument and supporting it. The authors have extensively revised this section to present the structure of an argument in clearer and more accessible terms than in the first edition. New distinctions are made among reasons, evidence, and reports of evidence. The concepts of qualifications and rebuttals are recast as acknowledgment and response. Part 4 covers drafting and revising, and offers new information on the visual representation of data. Part 5 concludes the book with an updated discussion of the ethics of research, as well as an expanded bibliography that includes many electronic sources. The new edition retains the accessibility, insights, and directness that have made The Craft of Research an indispensable guide for anyone doing research, from students in high school through advanced graduate study to businesspeople and government employees. The authors demonstrate convincingly that researching and reporting skills can be learned and used by all who undertake research projects. If you are a student writing your first paper for collage or if you are a seasoned researcher, this book is the best book on the subject you will find. The authors take great care in taking you step by step through the complex task for writing scientific and technical research papers. Starting with explaining why we write research papers, over the subject of how to construct a solid argument, to who we write for, it is all covered. Unlike other manuals, this one centers on the most important thing about research papers, the target audience. Quick Tips at the end of most chapters give you a solid starting point in case you run into problems with your own work making this book an indispensable reference on your desk. I also enjoy the fluid writing style that makes the book actually fun to read. You will be surprised how quickly you will be able to write a solid paper and identify flaws in other peoples work. This is a great book on writing a research report, useful for both beginners and seasoned researchers. It walks you through all the phases of your research project, starting from picking up your topic, through the actual research, note-taking, to writing up your findings, down to sentence level structure and style. For me a most useful part of the book was the beginning: finding a topic, defining your research problem, qualifying it, and determining your warrants; especially revealing was the relationship between your research problem and a wider body of theory, and how you must be explicit about your "warrants" to make a real contribution to "knowledge" or to "solving a practical problem." Even though I had read many other books on writing such as "The Clockwork Muse" or "Writing Your Dissertation in 15 Minutes a Day" none was as explicit as this one on how to combine both Research and Writing (the other books assume that writing a research project entails a progressive, smooth process: you pick a topic, you research it, and you write up your conclusions/findings), nothing farther from the truth; as I learned from painful experience and as was made explicit by this book, to my relief, a research project is a dynamic process in which research and writing go together; they complement and reinforce each other. This book teaches you just how to do this and it was the greatest lesson I learned. Great for the high school or intro for a prepatory course frosh year in college. Otherwise, past the intro and the elevator story, worthless. 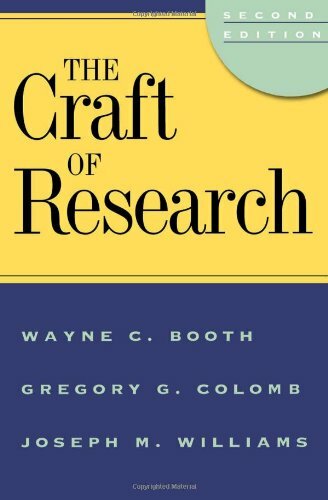 I picked up the book The Craft Of Research by Wayne Booth, Gregory Colomb, and Joseph Williams at the library awhile back, and I finished it over the course of this week. Not quite what I was expecting, but useful if you buy it for the right reason. I was looking for something more geared towards doing research for articles and such. This is geared towards the college student or professional researcher who has to produce research papers on a regular basis. It teaches you how to formulate your argument and properly research your material to make and prove your points. Probably very helpful if you have an actual project to do at the time you're reading it. Definitely a reference book you'd want to have on your shelf. That's not to say that you couldn't gain some insight on article writing from this book. It's just, in my opinion, a bit too advanced for the type of writing I would do. But because it covers the target audience well, I can't complain. This is certainly so when it comes to "The Craft of Research" as this is a fundamental point to remember when one is learning how to prepare research which is above and beyond the mundane and forgettable. "The Craft of Research" is told from the insiders perspective and ought to be carried on one's person to reflect and review in those quiet moments that are more and more widely spaced these days. Of course the business of finding the raw answers in short order is sometime key and I've found The Practical Pundit to be a quick solution to gathering my material prior to sitting down to order and write. Based on the Massachusetts Institute of Technology's five-million-dollar, five-year study on the future of the automobile, a groundbreaking analysis of the worldwide move from mass production to lean production. Japanese companies are sweeping the world, and the Japanese auto industry soars above the competition. Drawing on their in-depth study of the practices of ninety auto assembly plants in seventeen countries and their interviews with individual employees, scholars, and union and government officials, the authors of this compelling study uncover the specific manufacturing techniques behind Japan's success and show how Western industry can implement these innovative methods. The Machine That Changed the World tells the fascinating story of "lean production," a manufacturing system that results in a better, more cost-efficient product, higher productivity, and greater customer loyalty. The hallmarks of lean production are teamwork, communication, and efficient use of resources. And the results are remarkable: cars with one-third the defects, built in half the factory space, using half the man-hours. The Machine That Changed the World explains in concrete terms what lean production is, how it really works, and--as it inevitably spreads beyond the auto industry--its significant global impact. A great book that although becoming a little outdated portrays the ongoing trends in the automobile production industry in three major cultural areas. The three areas are;the Asian lean production (Toyota) v.s. the American system,(mass production) v.s. the European craftsman system. On a larger scale it will and is affecting manufacturing everywhere. early adherents to this system were other large Japanese companies, and responsible for the Japanese manufacturing miracle since the 1960's, as it was adapted from automotive to all manner of industries. production. The book does not explain in my mind the success of the German Auto industry. It seems to be the one exception to the rule. Excellent in-depth analysis of the automobile industry. In "The Machine That Changed the World", Womack, along with several other individuals, give an analysis of the Automobile Industry within global boundaries. This book was the summarization of a five year, five million dollar study by the Massachusetts Institute of Technology. Analysis was provided for both foreign and domestic automobile manufacturers with an eye toward the future. 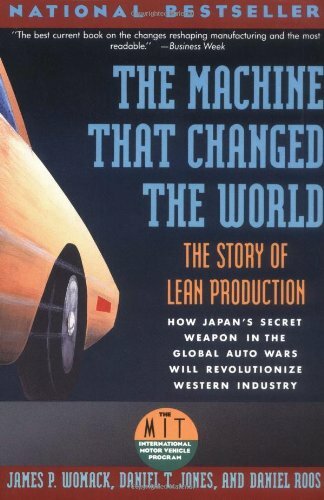 This book spoke "globally" far earlier than it was hip to speak in such terms, analyzing such foreign automotive powers such as Toyota, with their Toyota Production System, perhaps the greatest example of Lean Manufacturing in the world. For anyone who would like to learn anything about the automobile industry in general, or even further, would like to learn about successful business practices, I highly recommend this text. If you are just starting out learning about Lean Manufacturing, and you only have time to read one book, "The Machine that Changed the World" is an historically important book but "Lean Thinking" is the one that actually gets you started toward implementation. It's one of those rare occasions where the sequel was better than the original. This is the first book that I planned to read as a part of learning about lean, the other two books are "Lean thinking" and "Becoming Lean" , so far I could say that the "Machine that Changed the World" is a good benchmarking between craft, mass and lean producers. It mainly gives you an insight of the differences between lean and mass producers from the production, sales, marketing, customer relation and other dimensions. If you don't know about lean I really recommend you to start by reading his book because it will make you start to think in a lean way, if you know about lean and convinced about what it can do to you organization start with lean thinking and then go to "Becoming Lean". This book is aimed at strategic level and as a key tool to convince old timers about the lean-mentality against the push-mentality. I usually refer to this kind of books as "Open Minds", are written in a very simple way that may seem that the content is simple, BUT IS NOT. This book is in my opinion a must read for any Industrial Engineers, Managers, Supervisors. It can be used also for training and kaizen events. Silly is that one that reads this book expecting that he will know everything about lean manufacturing, JIT, or modern IE. It is a widely known but insufficiently appreciated fact that Albert Einstein and Kurt Goedel were best friends for the last decade and a half of Einstein's life. They walked home together from Princeton's Institute for Advanced Study every day; they shared ideas about physics, philosophy,politics, and the lost world of German-Austrian science in which they had grown up. 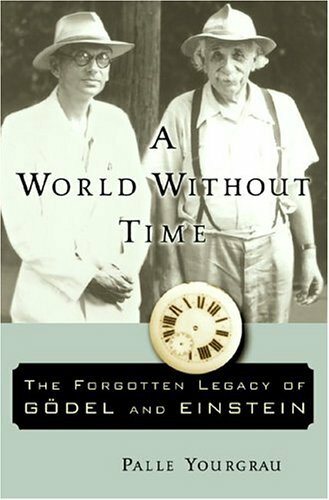 What is not widely known is that in 1949 Goedel made a remarkable discovery: there exist possible worlds described by the theory of relativity in which time, as we ordinarily understand it, does notexist.He added a philosophical argument that demonstrates, by Goedel's lights, that as a consequence, time does not exist in our world either.If Goedel is right, Einstein has not just explained time; he has explained it away. Without committing himself to Goedel's philosophical interpretation of his discovery, Einstein acknowledged that his friend had made an important contribution to the theory of relativity, a contribution that he admitted raised new and disturbing questions about what remains of time in his own theory. Physicists since Einstein have tried without success to find an error in Goedel's physics or a missing element in relativity itself that would rule out the applicability of Goedel's results. Philosophers, for the most part, have been silent.